If there is one brand out there synonymous with a good quest, that brand would certainly be Klim. For years they have specialized in gear for the adventurous type. The ones who trek on. Who don’t turn back when the trail ahead is anything less than stellar. With the introduction of the new Klim Quest Gloves, they are now putting that same ethos to work for riders who make their way via the street. The Quest gloves will come in two varieties. Whether you decide to go with the Klim Quest Long Gloves, or the Klim Quest Short Gloves, you are going to be selecting a pair of moto gloves that are built to last, through a wide variety of riding conditions. The only difference between these two options will be in the coverage that they provide. The long gloves will have a cuff that extends further up the wrist, and thus provides more protection. However, if you prefer the feeling of a bit more wrist mobility, and are willing to forego the coverage, the Klim Quest Short Gloves will be ready to go just the same. Each of these gloves is constructed from a complete leather outer shell which utilizes Gore-Tex & Gore-Grip technology to keep your hands both dry and receiving great tactile feedback from the controls in the wettest of conditions. Hard knuckle protectors and Poron XDR foam work to provide top-end impact protection, while 3M Scotchlite reflectivity allows your hands to be more visible to traffic in low-light scenarios. 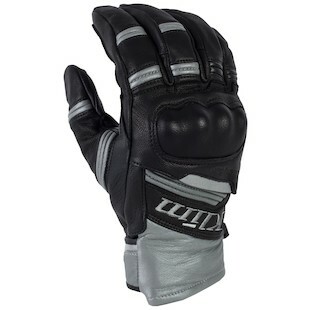 Additionally, the Quest gloves from Klim pay special attention to comfort and mobility through ergonomically designed closures and stretch areas, and a moisture-wicking internal lining. 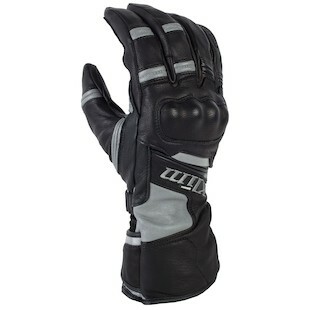 For a brand that made its name in the off-road and Adventure segments, the Klim Quest Gloves are a podium-topping option for long-range street riders who are of the don’t-turn-back variety.